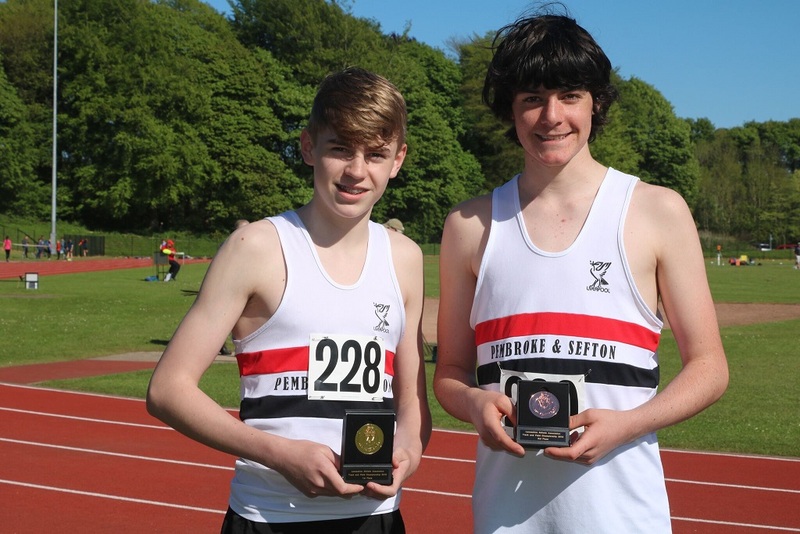 LPS athletes were spread across 3 counties as this year’s Track & Field championships that took place at the weekend. Jenny Pyatt won the senior women’s discus event with a throw of 40.52 metres which not only broke the Cheshire record, but it maintained her sequence of winning the county discus title at various age groups for the last 8 years. The Merseyside event was held at the Wavertree Athletic Centre and here there were two double gold medalists. Bill Steel (U15B) won both the javelin (36.97m) and the shot, with a new pb of 12.20m. Owen Southern was again successful in the high event (1.80m), but is now getting a growing reputation as a successful sprinter, with victory in the 200m event (23.13 sec). His fellow high jumpers were also in the medals. Sandy Clarkson reached new heights with a leap of 1.70m to win the U15B event and Kai Finch also took gold in the U20 event with a clearance of 1.90m. Tom Kwissa had to settle for silver behind Owen in the U17 event (1.70m), as did Imogen Ayres (1.50m) in the U17W age group. 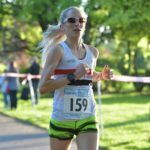 Kirsty Longley managed to run under 10 minutes for the first time ( 9:56,22) when she won the senior 3K and a determined effort from Hannah Doyle saw her knock 4 sec. off her pb (12.40.36) to take the silver medal in the U17 age group. Other winners, included Erin Birchall who won the U17W long jump (5.25m) and Bethany Swift in the U17W discus (10.76m), while Martha Simms took silver in the U15G long jump (4.84m). 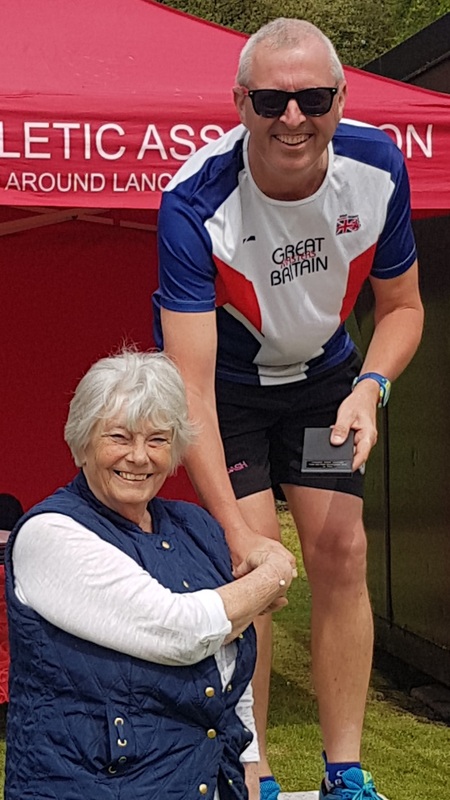 Mark Crompton, however, must surely be one of the oldest champions on record after winning the senior men’s high jump title (1.45m) at the age of 54, in the Lancashire event held at Witton Park. Lauren Lewis (U17W) won double gold with victory in the long jump (5.23m) & set a new pb in winning the 100m (12.5), as did Matt Ingram in the Triple (13.70m) & long jump(6.70m) events Abigail Bamber (U15G) took bronze in the 75m hurdles, despite only qualifying for the final as fastest loser. Her time of 12.3 was a new pb. Veteran thrower, Dave Brown, also took bronze with 10.77m in the shot to add to his medal haul. as did Grace Mitchell(U15G) in the long jump. Scarlett Whitfield set a new personal best in her new event, the triple jump (9.15m), but narrowly missed a medal in finishing in 4th place. Likewise did Lucy Bousfield(U13G), whose time of 14 sec. was her fastest run ever to finish 4th in the 100m, as was her run in the 200m (29.8). 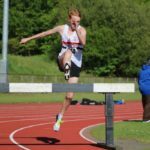 Twin sister, Chloe, narrowly missed a medal finishing in 4th place in the 1500m (5:40.7 Jamie Hopkins increased his long jump to 5.52m, to finish 5th in the U17m event and Thomas Ralfs had a creditable performance(4.31m) in the U15B event. Billy Matthews (U20M) set a new personal best in reaching the final of the 400m (50.40), as did Ciaran Scroggie (11.9) in the 100m final. However, it was an excellent weekend for the club’s middle distance runners. There was an incredible performance from U15 Mark Roberts who knocked 6 sec off the pb he set in the heats, to win the 800m in a time of 2:05.3. This from someone who missed most of last season through injury. He was closely followed home by Jake Dickinson who took the bronze (2:09.2), another excellent performance. Elder brother, Tom (U17) went one better taking the silver in his 800m race setting another personal best performance (2:04.0), but was less successful in the 1500m finishing in 4th place. 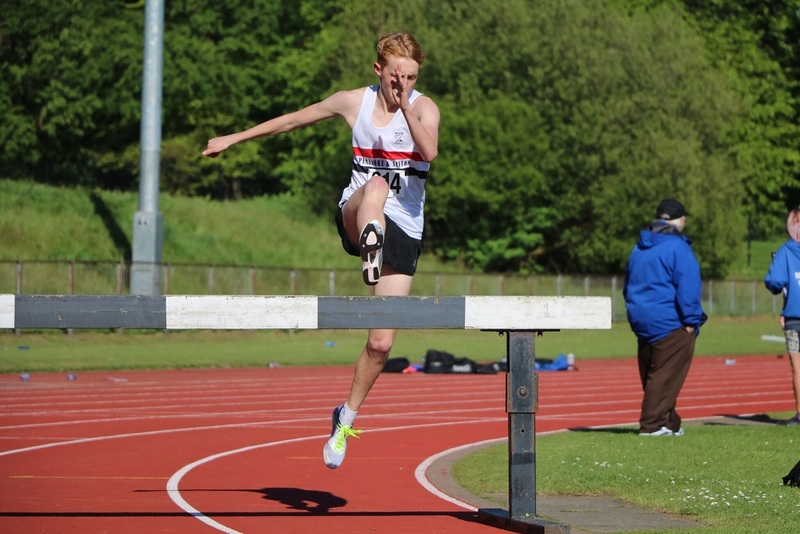 Adam Jones ran the 2K steeplechase for the first time and took gold with a time of 6:50.0, while U20, Ross Harrison, claimed bronze in the 1500m (4:12.6). 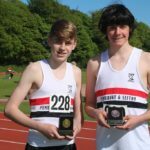 Youngsters, Zac Dickinson & James Roberts, failed to qualify for the final of the U13B 800m, but will have learnt from this experience. Elsewhere, Luke Edwards knocked over 2 sec. of his pb to clock 1.53.92 in the 800m race in the BMC meeting held at Sports City. James Metcalfe ran 1:59.18 in the same event. 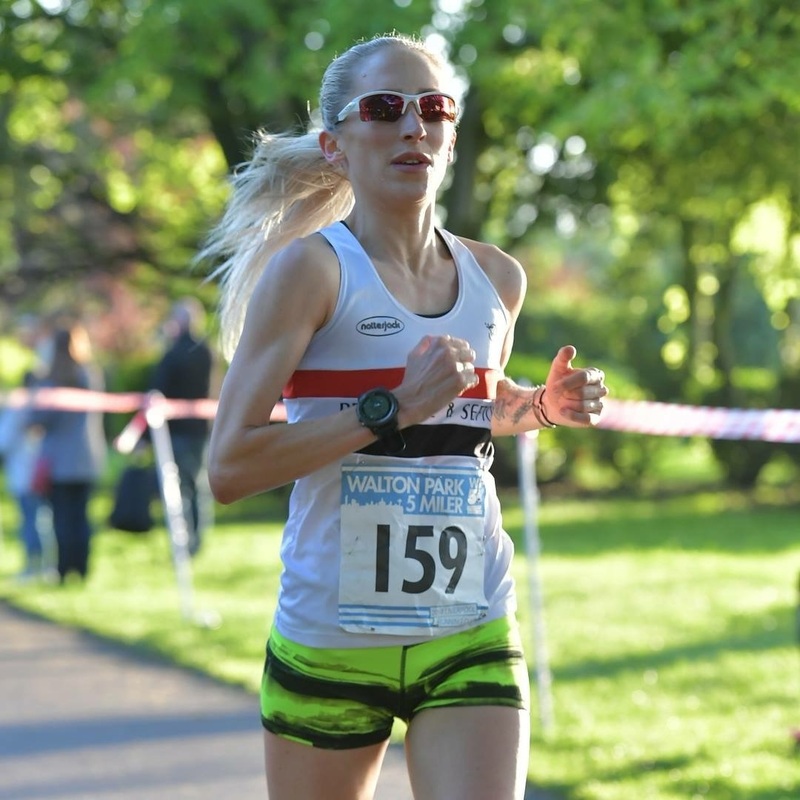 Lisa Gawthorne continued her fine run of form with yet another pb on the roads this time over 5 miles at the Walton Hall Park 5 on 8th May. Her time of 31.37 was an improvement on her previous best at this distance by 29 seconds and was enough to see her finish 4th in a good class field.